Synopsis: After suspecting that their police officer neighbor is a serial killer, a group of teenage friends spend their summer spying on him and gathering evidence, but as they get closer to discovering the truth, things get dangerous. Review: Nothing soothes the soul more than a good dose of nostalgia and Summer of 84 uses that to its advantage, elevating to a higher plane what feels like a second-run ‘80s YA novel. Audiences that have binge watched Stranger Things, filled up on 2017’s IT remake, or even if they are just desperate to have a new throwback title added to their horror rotation will likely feel a little tingle reading the plot description and hearing the first strains of Summer of 84’s synth-heavy score. In and around the small town of Cape Bay, a serial killer has been operating for almost a decade. With 13 boys that have gone missing, the Cape Bay Killer has been prolific and increasing in frequency. After a series of strange run-ins, Davey Armstrong (Graham Vereche) becomes convinced his docile next door neighbor Wayne Mackey is the man behind the killings and enlists his three friends to help him prove his theory is correct. Complicating matters are the parents being totally absent or not believing their sons and the fact that Mackey is a decorated police officer known for his contributions to the community. As the summer progresses and the boys get increasingly bold in their quest for answers, the tables are turned as they become the hunted after catching the attention of the killer in question. But is it Wayne (Rich Sommer, Hello, My Name Is Doris) or someone else on the periphery they haven’t even considered? While it isn’t that hard to see where the film is going or what the final reveal will hold, some sustained suspense is created as we bounce back and forth in wondering who the killer could be. It’s scrappy stuff, from two writers and a team of three directors (collectively known as RKSS) and while it hits all the right notes it doesn’t necessarily create totally sweet music. For one thing, it’s too long and has a several extra characters that feel secondary to the core plot of the friends doing their Hardy Boy-ish work figuring out if Wayne is the killer Davey thinks he is. There’s an unnecessary love interest for Davey who has her own issues to work through and the finale switches from being a amber-hued retro flick to an overly violent slasher film. It’s in those final moments the filmmakers make a choice and wind up going too far, making a decision that I felt ruined much of what had come before. 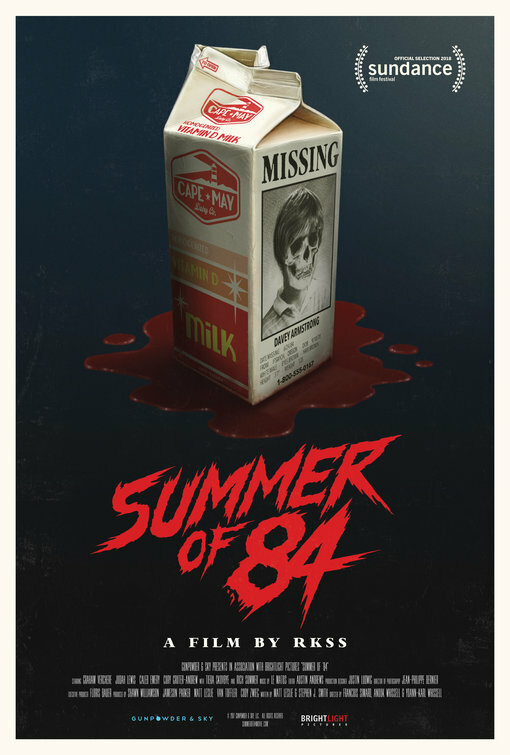 Not as successful as similar offerings that are popping up but still worth it if you’re looking for a well-made old school option, I wonder if there’s another film that could follow Summer of 84 and expand on what the writers set into motion. I’d be interested to see what they cook up.